Wilkinson upset Matthews in Jam-Down Clash! 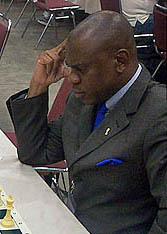 Bertram Scott, "Jamaican Chess Championship," Jamaica Ambassadors Chess Academy, 11 September 2006 (Kingston, Jamaica). JCF President, Ian Wilkinson, slew National Master Shane "The Magician" Matthews in the 7th round of the national championship on Sunday at the Norman Manley Law School. It was Wilkinson's second straight win over the tough, seasoned Jamaican chess stalwart in as many games, and his first win in the nationals. New national master, Equitable Brown took the lead in the championship with 5½ points after scoring a win over NM Mark Holness, while NM Russel Porter kept pace with the leaders by taking the full point from Andrew Mellace and moved into second place. Defending champion, FM Warren Elliott's recovery continued as he got the job done against Mark Henry, and WFM Deborah Richards picked up her third win with a victory over Christopher Buchanan. The Jamaica Chess Championship continues on Saturday, September 16 with round 8 at the Norman Manley Law School.